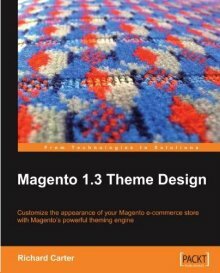 Magento 1.3 Theme Design, by Richard Carter, is a guide to designing for the Magento Commerce ecommerce platform. There’s a review of my book on Dmitri Dulepov’s website here, and the book is even showcased on the wall at Magento HQ! Magento is an open-source project, and it’s incredibly powerful, but there’s a lot to take in at first glance, and Magento 1.3 Theme Design helps with this. I’ve designed for a lot of different software in the past – including MediaWiki (see my MediaWiki Skins Design book), WordPress and Drupal – and theming Magento presented a challenge. Its architecture means that it can be difficult to pin down exactly what you need to edit to effect an element, so Magento Theme Design is designed to help make the reader’s life easier. As an experienced themer of many open source packages and as a Magento consultant, the aim of the book is to make it easier for those new to Magento to pick it up and start building great-looking ecommerce websites. What does Magento Themes Design cover? The book covers quite a wide range of topics, from the basics such as changing your store’s logo and understanding the terminology surrounding Magento, to creating print stylesheets for Magento and integrating social media (quite a popular topic in my MediaWiki book).